If you've looked at fridges recently, you'll know just how much variety there is. How they open, how big they are, what sorts of configurations they have for refrigeration and freezing, surface materials and technologies, ice and drink dispensers, internet connectivity - all things you might need to consider. The first (and perhaps the most important) thing you'll need to take into account is the capacity you need. There's no point in having a giant fridge if you're never going to use half of the space it offers - but at the same time, a fridge that's too small will quickly become a disorganised mess, which in turn can lead it to be overworked and eventually drive it to an early grave. For that reason, we've given the capacities below as a range rather than an exact number. If you're a young, single person who's never at home, a 100L bar fridge may well suit your needs for a week's worth of food and beer - but it's not likely to suit those of someone who cooks lunch and dinner every day. For the same reason, larger families will also have vastly differing needs based on what they cook, and how seriously they do so. Use your discretion to decide which end of the scale you belong on. Top mount fridges: the freezer sits above the fridge and offers wide shelf space. Bottom mount or upside down: The freezer is below the fridge. French doors: Come in a wide variety of configurations, but the most common these have a double-door fridge compartment above, with a pull out freezer drawer below. Others may have a fourth door. Side by side: These offer a fridge and freezer side-by-side, with a wider fridge compartment and narrower freezer. These are great for inside fridge space, but are wider than conventional designs and will require that you have enough space. Pigeon pair: Great for large families, as these offer one full size freezer and one full size fridge which stand side by side. You'll need a big kitchen and extra wide fridge space to accommodate this type of fridge. French-door style fridges are particularly popular these days because they open up to make the best use of the available width. A side-by-side or pidgeon pair, by comparison, has a dividing wall down the middle which means that their fridge compartments are considerably more narrow. If you're buying a combined fridge freezer (most of us do), it's a good idea to carefully consider how much freezer space you'll need. 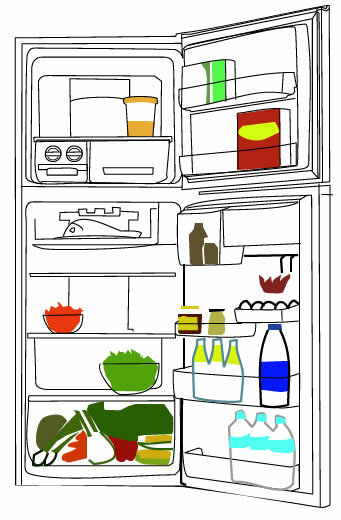 Space in an 'average' sized fridge may be split 70:30, 60:40 or even 50:50 between the fridge and the freezer. If you're buying a tiny 100L fridge, think very carefully about how much freezer space you need, because most fridges this size have barely enough for a bag of peas and some ice. If you've got a big, hungry family, it may be worth considering an extra chest freezer to make sure your needs are met too. This is also a good way to free up a bit of space in the kitchen, and also save a bit of money by buying food in bulk. One of the more important things to look at (particularly with rising electricity prices) is how efficient the fridge is. Refrigerators, like other major electrical appliances, come with Minimum Energy Performance Standards (MEPS) ratings that show you how well each new fridge performs relative to other fridges on the market with similar specifications. Each fridge has a star rating - these ratings go up to 10 stars for super efficient fridges. Some fridges will still use a star rating out of 6 stars if they don't exceed that rating. Over time, an energy efficient fridge is likely to cost you considerably less than an inefficient fridge in terms of operating costs. When you're planning where your fridge will go, keep in mind that you'll need to leave a minimum of 20mm clearane on either side of the fridge, and 50mm above the fridge. Of course, different fridges will require different amounts of clearance, so it's a good idea to check with the retailer and measure your kitchen before you commit. If you're integrating the fridge into your cabinets, you'll also need to leave a minimum of 200mm behind any cabinets above the refrigerator for the purpose of ventilation too. Take careful note of where your power points are installed and ensure that there's one available. Consider a frost free fridge - this means there is a prevention of ice build-up as the fridge uses a fan to circulate dry, cold air through the freezer. You'll find that the quality of your food is better. Look for adjustable shelving where possible. Safety glass or plastic is easier to clean. Consider a fridge with a salad crisper, dairy compartments and/or deep door storage. Some fridges make noise. If you live in a small apartment or have a compact kitchen, choose a fridge with a quiet fan. Super thin insulation technology allows for greater internal capacity.